The first time you display a report, TM automatically sets the column widths to the defaults. 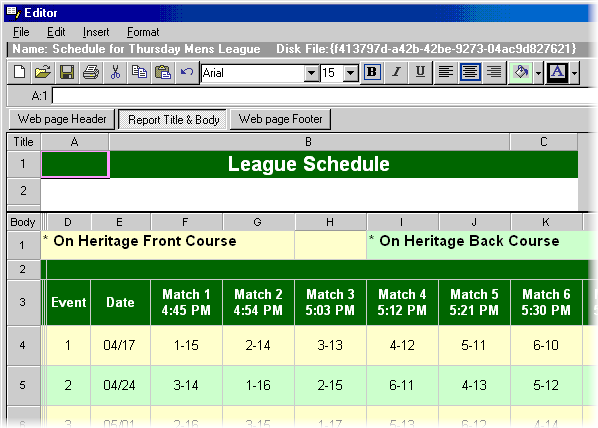 In most cases you will want to resize the columns to fit your own specifications. You will notice that columns are numbered 1,2,3,etc. Columns can be resized by clicking the line between the column numbers and dragging right (make the column bigger) or left (make the column smaller). Row heights can also be changed. Click the row sizer on the left side of the screen and drag down (make the row bigger) or up (make the row smaller). TM will ask if you want all rows the same size. If yes then all rows will be resized, if no then only the selected row will be resized. TM automatically saves the column widths and row sizes you have set...so the next time you display the report layout it will use the widths you have specified. Tip: You can quickly eliminate a player from a report by resizing his\her row so that it is no longer visible. To quickly set column widths back to the defaults, pull down the Tools menu and select Reset column widths. TM allows you to further customize any report or view by sending it to the Editor. Any report or view can be altered, saved, printed, sent to the web, and retrieved later with all changes saved. If you are familiar with “Excel” (Microsoft’s spreadsheet program), the editor works just like that program. It is basically a scaled down version of Microsoft Excel. Text can be inserted, deleted, and edited. Fonts size, style, type, alignment, etc, can be set to anything. Pictures can also be added. Background colors and font colors can be customized too. Plus, rows and columns can be added, deleted, and resized. Copy, cut, paste any text. Basically anything you can do in a spreadsheet can be done to a report or view. View the Report on the screen. On the Editor menu, click Send current ‘report’ to Editor. Note: Once a report or view is sent to the Editor it simply becomes a document that you can edit. In otherwords, any changes you make to the "document" in the Editor do not affect how the report will be displayed the next time you generate it.